If there’s one thing that I believe all divers have in common it’s that somewhere deep in the recesses of our subconscious minds, there’s a remote hope that’we’ll discover treasure. As a kid, I remember reading a book from the library that was an account of Mel Fisher’s search for the Nuestra Señora de Atocha, which was still yet to be found. In fact, the Spanish ship wouldn’t be discovered until the min-1980’s, quite a few years later. It was interesting to me because the book detailed the processes and equipment, like the “mailboxes” as they called them, shrouding the boat propellers, used to direct water pressure downward to blow holes in the sand. It also recounted financial problems and introduced the reader to key individuals and stakeholders involved in the search. 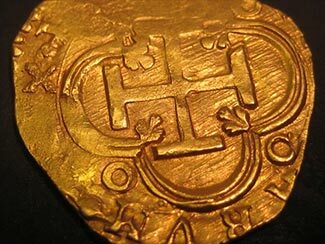 Now, decades later the Atocha is still producing treasure. I had no idea! I remember a jeweler here in Reno exhibited hundreds of Atocha pieces, many of which were for sale. In a way it bums me out to see the Atocha’s booty dispersed, but that’s not for me to decide. Anyway, it’s fun to see that the Ship continues to reveal her secrets. This entry was posted in Diving News and tagged Nuestra Señora de Atocha, scuba history, shipwrecks, wreck diving.